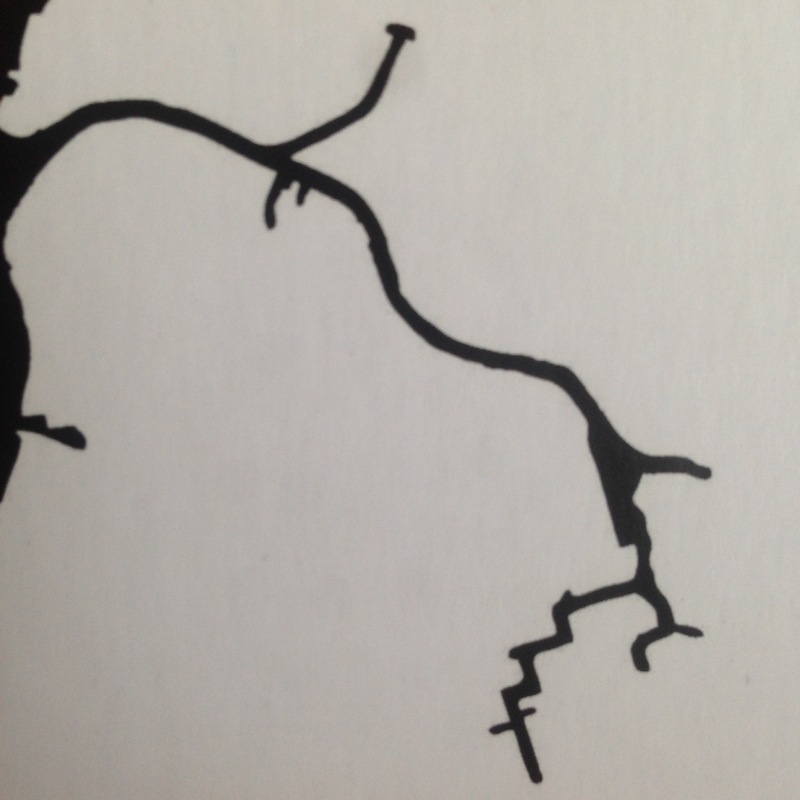 This is the design on the back of Newtown Creek Alliance business cards. What the…? Ah, of course. It’s the creek, coming off the East River to divide Queens, on top and to the right, and Brooklyn. The Brooklyn neighborhood of Greenpoint is essentially a peninsula. To be more specific, it was a marshy creek, long ago, draining off the terminal moraine, but in the 19th and 20th centuries it was bulkheaded, canalized, and heavily industrialized. There are still limited access points and there’s plenty of old poison — Greenpoint is the location of one of the largest underground oil spills in the country — yet life is hardy. Cormorants continued to fly by as we stood on the Kingsland Wildflower Roof. Two-legged critters in the ‘hood are hardy, too: a friend who regularly paddles on the creek reports herons, Osprey, Kingfishers going after life in the tidal waters. We heard a Kestrel while up there (my mouth was full of cookie at the time so I could barely called the visiting British writer’s attention to it.) 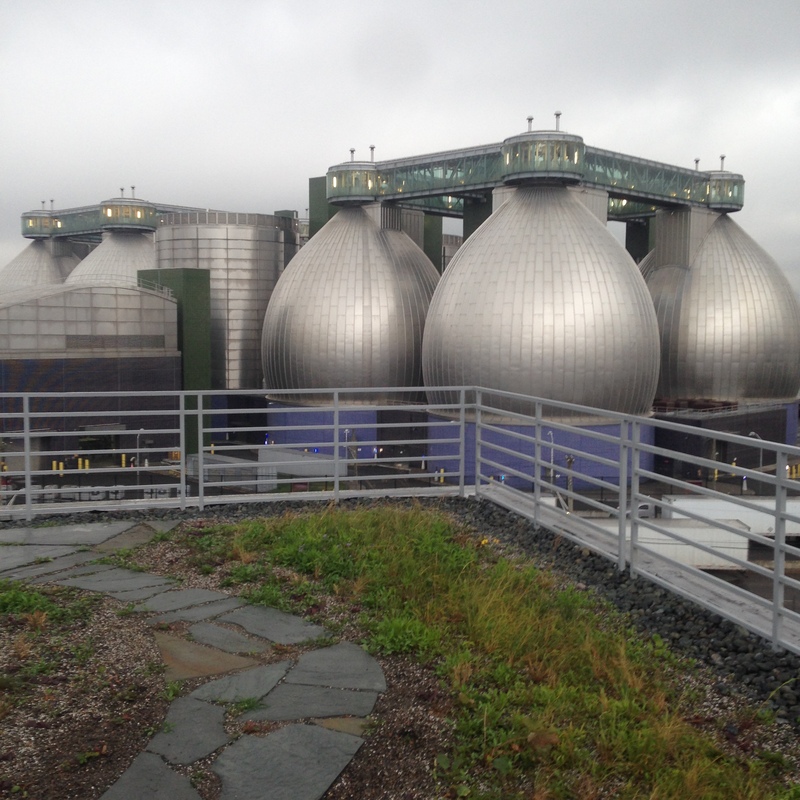 Here’s the view from that Wildflower Roof looking towards the Digester Eggs of the massive wastewater treatment facility that dominates this end of Greenpoint. That’s our sold waste, lovely euphemism, being digested by bacteria. Go, team bacteria! Bubble, bubble, toil and trouble. The remaining cake of material leftover can be used as fertilizer. And talk about how architecture can enliven the scene.